middle row, 3rd from the right. whirlwind tour covering the campaign. Another friend changed her name to what her parents apparently originally intended - I recognized her photo so I knew it was her. Some people posted photos of themselves from our time on campus. Some look the same, some look very different. It's interesting to see how our perspectives change over time, and how in the end, I think we Obies do stick together. It must have been all those nights in Mudd, studying for finals in the famous "embryo" chairs. 1. If you group your friends list and give it a separate name, you can easily send links and posts to that group without having to type everyone's e mail. Just import using the Selection Tool from your All Friends groups to whatever you have named the new group. 2. I created the badge above using the link at the bottom of the Profile page. You can create a horizontal badge like this one, or a vertical badge, and then copy and paste the HTML Code. 3. I had trouble uploading photos and kept getting an error message. If this happens to you, go ahead and use the link they provide just below the upload area, and it will let you upload directly from the files you select off your hard drive. No problem on this once I switched methods. 4. If you are uploading videos, they have to be under 20 minutes, and make sure they have an extension, such as MOV for Quicktime, otherwise you will get an error message. 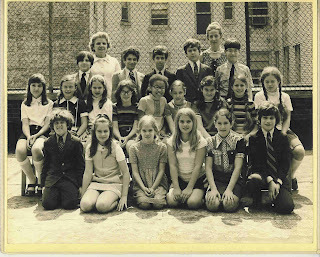 As if all that nostalgia weren't enough, here is a link to 2 grade school photos from The Fleming School in New York, that I stumbled upon last night when trying to find an old friend. It's amazing how well I remember all my classmates. The photo is also pictured above, I am in the middle row, 3rd from the right.